Yet again, the Pope has spoken through Vice -- his deputy, that is. In an interview with Famiglia Cristiana -- Italy's largest magazine -- the Secretary of State Cardinal Tarcisio Bertone outlined his Boss' '08, and the pontiff's priorities and plans in the New Year. While Italian affairs dominated Bertone's sit-down with the Pauline journal, the Salesian cardinal whose penchant for candor has made him Benedict's de facto chief spokesman didn't resist the temptation to delve into the affairs of the global church and the wider world. Confirming reports that the drafting of Papa Ratzi's talks for his mid-April visit to the UN headquarters in New York and the East Coast are well underway, the SegStat -- whose office has particular responsibility for the 18 April UN address -- offered a preview, announcing that Benedict "will confirm the irreplacibility of the United Nations." Separating Benedict from pockets of church conservatives who've targeted the UN, the cardinal reaffirmed that "the Catholic church has always supported the work of the United Nations and will not change [its] policy." "The address of Benedict XVI," he said, "will confirm the need to focus on the values that underpin [its] historical international declarations, simply from a concern over the difficulty of holding together in a sole world assembly almost 200 countries with different political and ideological backgrounds." As the April visit to New York and Washington will be the first papal trip to the States occurring against the backdrop of a presidential election year, Bertone said that "the Pope is above factions." "Somebody said that the US is always in campaign season," the cardinal noted. Even so, he admitted that "eventual exploitations" of the pontiff's presence and message "cannot be controlled." Widely viewed as the Vatican's most powerful "prime minister" since Cardinal Eugenio Pacelli (the future Pius XII) stood alongside Pope Pius XI, Bertone returned to his Pope's most controversial document -- the July motu proprio allowing wider use of the pre-Conciliar 1962 Missal. Noting the impending publication of a further instruction to "set the criteria" for the application of Summorum Pontificum, the cardinal said that the varying reactions to the document have reflected "discomposure." 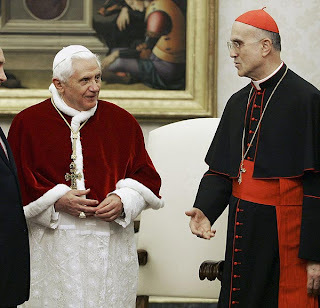 "Some arrived at accusing the Pope of having reneged" on Vatican II's liturgical teaching, he said, while others "have interpreted the motu proprio as the authorization of a return toward the sole [use of] the preconciliar rite." "Both positions are erroneous," he said, terming them "exaggerated episodes that do not correspond to the intentions of the Pope." As regards the international situation, Bertone said that the Holy See is pursuing ever more "openings and contacts" in its relations with China, praising its Communist leaders for "recognizing the positive value of religion" in 2007. Concerning Israel, while noting that the Vatican's "understand[s] the problem of [its] security," safety concerns cannot morph into "a negative attitude" toward its Catholic population. And Latin American leaders, he said, always need to "learn from and listen to the people." To mark the 10th anniversary since Pope John Paul II's trip there, Bertone said he will visit Cuba in February, where he hopes to meet with interim President Raul Castro. Benedict will get to address the international situation in his own voice next week during the Pope's traditional "State of the World" speech to the diplomatic corps accredited to the Holy See. An appeal for a "revived synergy" among the Catholic press also came up in the cardinal-secretary's remarks. Mentioning that certain agencies -- with Zenit cited by name -- "hold an important place in the media," Bertone said that "more needs to be done: connections between Catholic publishers, communication faculties, newspapers, radio and television." As with church-affiliated non-governmental organizations, he said that the goal must be "common actions, not separated -- or, worse still, pitted against each other. "The conciliar idea of 'church-as-communion,'" he said, "must be translated into the daily work of the NGOs and the Catholic media: [either] work together more effectively, or otherwise risk decline and lose the challenge of engagement with modern society." As the Pope's talking points have been veering more decidedly of late toward appeals to natural law and a common sense of morality, Bertone took up the papal push in his interview. Recalling how the controversial lobbying by the Italian church against legislation for unmarried partners made 2007 a "demanding year" for the country's Catholics, the cardinal cited the natural law in declaring that "the church's position is not a partisan one." "The concept of secularism opposed to religiosity is antihistorical," he said, bringing the president of "the most secularized" France, Nicolas Sarkozy, into his point. On the French leader's Vatican visit last month, the cardinal quoted Sarkozy as saying that "the Catholic church is a resource and not an obstacle or a threat to the development of the country. It doesn't differ with republican ideals." "I've personally known great Communist and Socialist intellectuals who have had a secular, yet moral, vision," Bertone said, noting that despite their differences with the church, the thinkers were still able to "believe in an authentically moral and ethical project." Benedict's natural law tack -- which, some observers expect, will result in a magisterial text on the concept sometime this year -- isn't just getting attention in Italy. High on the Pope's radar screen is said to be a Washington conference on "A Common Morality for the Global Age" that's been arranged at his personal request. Three years in the planning, an international A-list of academics and other experts are slated to attend the four-day symposium in late March at the capital's Catholic University of America. The gathering's keynote will be delivered by a member of Benedict's "kitchen cabinet": the patriarch of Venice Cardinal Angelo Scola, and the pontiff -- who'll be spending a day on the university's campus two weeks later -- is reportedly keen to get a full briefing on the proceedings.